Tom Nunnally was born on October 20, 1919, in Thurmand, West Virginia. He was commissioned a 2d Lt in the Corps of Engineers of the U.S. Army through the Army ROTC program at West Virginia University on July 21, 1941, and served at Fort Belvoir, Virginia, from July to September 1941. 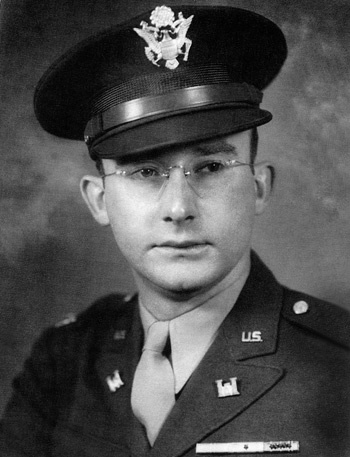 Lt Nunnally deployed to Iceland with the 5th Engineer Combat Battalion in September 1941, and later transferred to England to train for the invasion of Continental Europe. He landed in France with his Battalion in June 1944, and returned to the U.S. briefly in November and December 1944. During World War II, Capt Nunnally participated in the Normandy, Northern France, Ardennes, Central Europe, and Rhineland campaigns, returning to the U.S. after the war in August 1945. Maj Nunnally served at Camp Claiborne, Louisiana, from August 1945 until his honorable discharge from the Army on February 3, 1946. Tom Nunnally died on April 4, 2010. For meritorious service in connection with military operations against the enemy as Purchasing and Contracting Officer and Supply Officer, 5th Engineer Combat Battalion, from 27 September 1944 to 10 October 1944, in Holland. During the construction of a vital 600-foot bridge, Captain Nunnally, displaying marked initiative and keen foresight, supervised the obtaining of supplies from both military and civilian sources. He personally directed military personnel in cutting and milling the lumber, and the civilian personnel engaged in cutting, forging, and threading metal parts. By his untiring efforts and devotion to duty, Captain Nunnally provided supplies as needed and contributed materially to the rapid completion of the bridge.